For surfers traveling on a budget too tight for a hotel, an Airbnb, or maybe aren’t comfortable couch surfing, there’s camping. 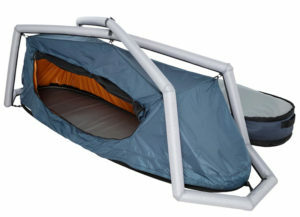 In the past you’d need to pack an extra tent or a sleeping hammock like a Hennessy Hammock, but there is another solution even more minimalist — sleep in your board bag! It’s not a new concept and one Bitness.com wrote about over seven years ago with the WaveCave. The Boardswag doesn’t appear to be for sale just yet, but hopefully they can bring the product to market for budget conscious surfers in the market for a new bag that can hold 3 + boards, gear and pump. Visit The Boardswag to signup and be one of the first to get your hands on this new board bag!